We can provide a number of delightful designs, or we can custom build something especially tailored to your event. 4 – 5 feet. $100.00 + Tax & Delivery. 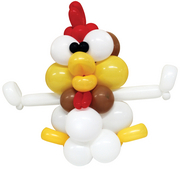 Make an unforgettable impression with a balloon baby – perfect for that upcoming baby shower! 5 ½ – 6 feet tall. $275.00 + Tax & Delivery.This darling sculpture is an adorable way to add an air of celebration for new babies, 1st Birthdays, and Baby Showers. Just change the pink to blue for a boy. 5 ½-6 feet tall–$215.00 + Tax & Delivery. Perfect for any event with a jungle, circus, or zoo theme. 5 – 6 feet tall. $250 + Tax & Delivery. Go wild! This awesome lion sculpture is perfect for sports teams, lion mascots, baby showers, or any jungle/circus themed event. Nearly 6′ tall; $149.99 + Tax & Delivery. Adorable cow character is perfect for western-themed events – and even Texas Baby Showers! a big ole baby chick! 6’x6′; $225.00 plus Tax & Delivery. 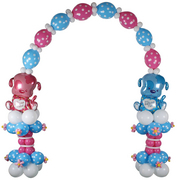 Incredibly cute arch perfect for the gift table; great accent for toddler birthday events! 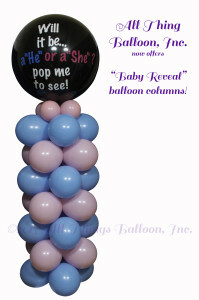 “Its a Boy” Rainbow centerpiece.